Looking for a brighter smile in Chilliwack? 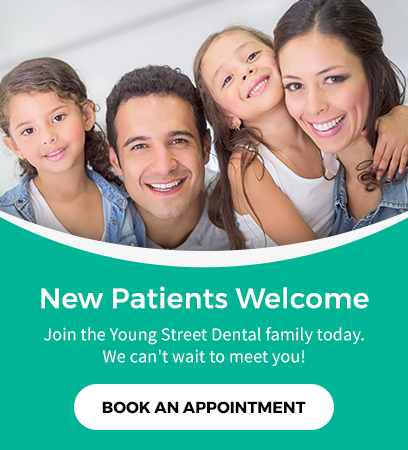 Young Street Dental offers both in-office and take-home teeth whitening kits! Hydrogen peroxide in the form of 35% carbamide peroxide at a near neutral pH is the active ingredient. As the carbamide peroxide mixes with water and is activated by the blue LED light, hydroxy free radicals (Oxygen atoms) penetrate the tooth enamel to break down stains and dissolve the discoloration. A review of available studies indicates no evidence of harm to enamel based on current whitening protocols. We will be using a gel at a pH of 6.5 which is virtually neutral. In addition, Xylitol is added which will increase saliva flow to mineralize the enamel during the whitening process which helps reduce sensitivity. Potassium nitrate is also added to reduce potential sensitivity as well as being an additional oxidizing agent. What about crowns, veneers or tooth colored fillings? All of these stain over time to the varying degrees of lifestyle habits of smoking, eating, and drinking. If the porcelain crowns or veneers have stained then the bleaching process can help remove the accumulated stains. Tooth colored fillings will not whiten by the bleaching process. Will my teeth be sensitive? Over 98% of people will have no tooth sensitivity. In order to protect the gums from sensitivity or blanching during the whitening process, a light cure liquid rubber dam is applied to the upper and lower gums at the front of the mouth. This ensures an added level of safety when using the gel. Usually any sensitivity that does occur will be from bleaching gel oozing out of the tray. Rinsing with water after the session will remove this from the mouth. Just like you, we recommend your child visit the dentist at least twice a year. This routine should start after their first tooth appears.